One of the first mathematicians to investigate the knight’s tour was Leonhard Euler. The first procedure for completing the Knight’s Tour was Warnsdorff’s rule, first described in 1823 by H. C. von Warnsdorff. But Indians solved 600 years before Euler. 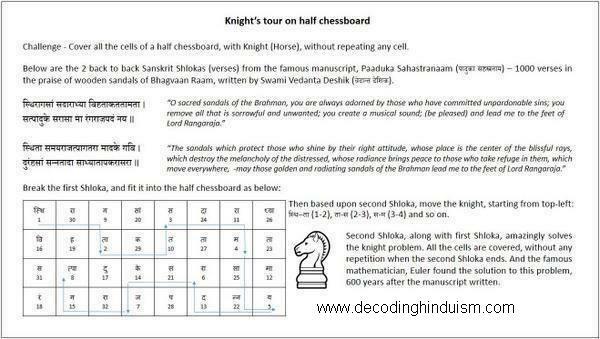 This entry was posted on June 29, 2015 by Sanatan Dharm and Hinduism in knight's problem and tagged knight's problem.